British NCO served with 5th Bn Manchester Regt in GB and at Gallipoli, 1914-1915; served with 203 Machine Gun Coy, Machine Gun Corps in GB and on Western Front, 1916-1917; served as officer with 8th Bn Tank Corps on Western Front and in Germany, 1918-1919. REEL 1: Background in Wigan area, 1894-1908: father's employment as weighing clerk at Worsley Mains Colliery; lifestyle; education and leaving after passing labour examination, 1899-1906; office work, 1906-1908. Recollections of work at Worsley Mains Colliery, 1908-1914; attending evening classes and colliery managers' course at Mining and Technical College, Wigan; varied duties in colliery to gain experience; conditions in mine; promotion prospects; tea breaks; safety regulations; National Union of Mineworkers. REEL 2 Continues: accidents and compensation arrangements; qualifications required prior to becoming colliery manager. Recreational activities,1908-1914: work as assistant scoutmaster with St Marks 1st Newtown Boy Scouts, 1912-1914; involvement with Church of England Men's Society, 1913-1914; sports. Recollections of training with A Coy 5th Bn Manchester Regt at Wigan Drill Hall, 2/1913-8/1914: recruitment procedure following failure of attempt to join yeomanry unit, 11/2/1913; drill; rifle training; tactical training at annual camps; origin and opinions of officers, NCOs and other ranks; awareness of threat of war with Germany. REEL 3 Continues: signal section training; question of pride in unit. Recollections outbreak of war whilst on holiday with Scouts in Wales, 4/8/1914: call up as territorial; reactions; question of length of war. Recollections of reporting to Wigan Drill Hall, initial billets, cycling to Littleborough, period in tent camp and volunteering for overseas service, 8/1914-9/1914. Recollections of voyage aboard Caledonia to Alexandria, Egypt, 10/9/1914-24/9/1914: conditions; signalling duty; passing troop convoy; visit to Malta; first impressions of Alexandria. Recollections of conditions of service and daily routine at Mustapha Pasha Barracks, Alexandria, 24/9/1914-21/1/1 915: accommodation; kit inspections; training and overnight bivouacs. REEL 4 Continues: signal training and procedure; visits to Alexandria; relationship with Egyptian and Greek civilians; sea bathing; Christmas celebrations, 25/12/1914; promotion to corporal; absence of organised recreations; bugle calls; role as corporal; attitude of Egyptian civilians and parade to 'show flag'; desert outpost duty; preparations for guard duty inspections. Recollections of period at Heliopolis Camp Cairo, 21/1/1915-3/5/19 15: tent accommodation; training and question of trench warfare; arrival of Australian troops; second hand reports of 'Battle of the Wazza' in Cairo; relationship with Australian troops and impact of their higher pay. REEL 5 Continues: knowledge of Turks attack on Suez Canal; rumours of attack on Turks; inspection parade in front of Hamilton and Maxwell; conditions during route march to Helwan; news of Gallipoli landings. 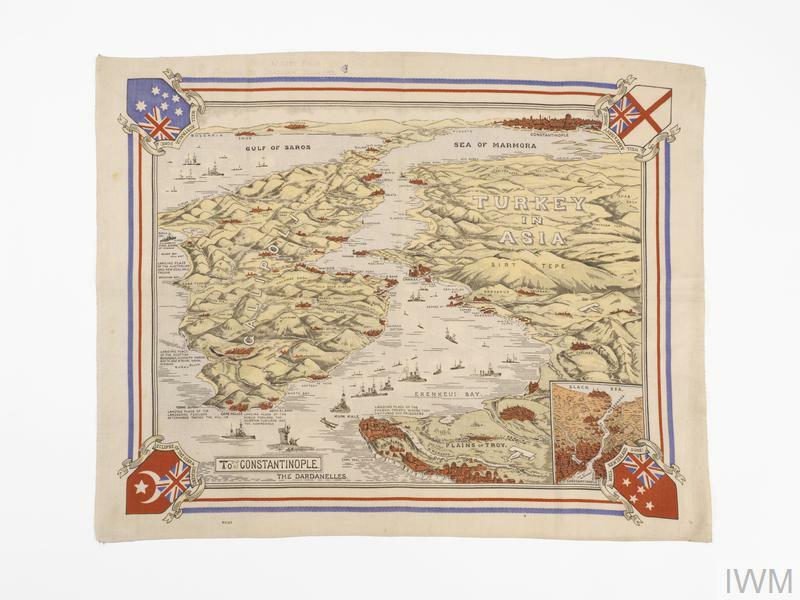 Voyage on Derrflinger to Cape Helles, Gallipoli, Turkey, 3/5/1915-6/5/1915: active service kit and uniform; ships former role carrying wounded; personal morale; landing at V Beach and bivouacs at W Beach, 6/5/1915. 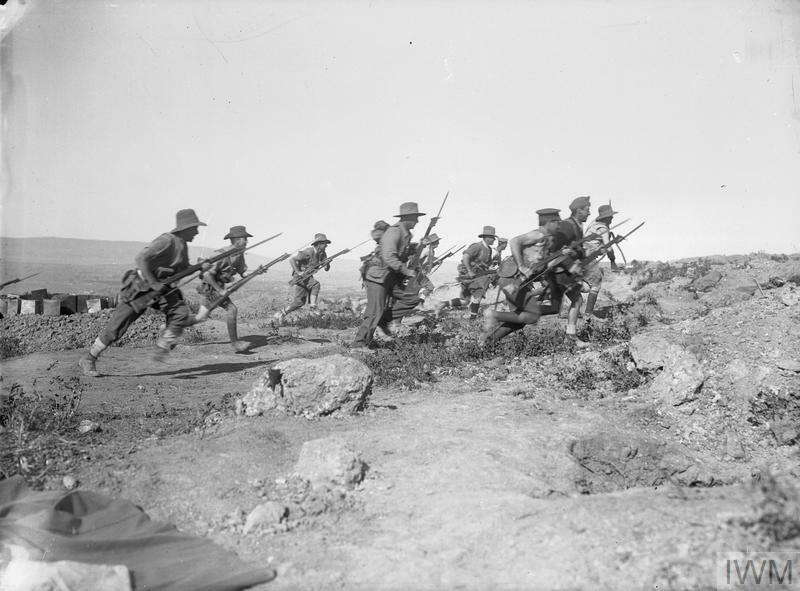 Move up into reserve lines, 7/5/1915: terrain; use of artillery formation; reason for discarding pith helmet; divisional dispositions at Gallipoli; nature of trench. REEL 6 Continues: Reserve role in Second Battle of Krithia, 7/5/1915-8/5/1915. Recollections of conditions of service, lifestyle and daily routine during periods in front line in Krithia Nullah sector, 5/1915-8/1915: situation; distribution of rations; food rations and improvised meals prepared; water supply; rum and lime juice rations; shaving; latrines; problems with lice; flies and dead bodies; state of health and septic sores; stand to; daytime activities; signallers use as runners; digging of new trench nearer to Turkish line prior to attack on 4/6/1915. REEL 7 Continues: story of taking telephone out to contact working party in advanced trench and being caught in no mans land prior to attack on 4/6/1915; introduction of telephones. Recollections of attack towards Krithia, 4/6/1915: preliminary bombardment and ruse to catch Turks; role as signaller in advancing with second wave to old Turkish front line and establishing and maintaining telephone link with battalion HQ; breakdown of attack; morale and reaction to casualties. Recollections of period in Krithia Nullah sector, 6/1915-9/1915: duties on promotion to platoon sergeant including sentry supervision, checking rifles and ammunition, distributing rations and giving first aid to wounded; relationship with other ranks; relative role of officers and NCOs. REEL 8 Continues: dysentery problem; septic sores; inadequate training of reinforcement drafts; artillery fire; sniping; question of general small arms fire; duties in charge of working party unloading stores from trawler; parcels and letter contact with GB; aspects of diversionary attack, 6/8/1915; promotion to company quarter master sergeant, 8/1915 including administrative duties and methods employed, control of rum ration and question of age and level of responsibility. Move to Gully Ravine sector, 9/1915. REEL 9 Continues: Recollections of period in Gully Ravine sector, 9/1915-11/1915: ravine's role as communications channel; terrain; dugout; Birdcage Walk front line trenches; Turkish bombing and introduction of jam tin bombs; visits to front line; question of role and conditions of service of officers; opinion of state of campaign; effect of casualties on unit strength; climate; reinforcing front line during attack by C Coy. Aspects of earlier rest period at Imbros, 6/1915: speech by Hamilton; church service; padre and burials. Evacuation with dysentery and jaundice, 14/11/1915: reactions; meeting Kitchener whilst at Mudros, Lemnos; voyage on Dunvegan to GB; hospitalisation and convalescence, 11/1915-1/1916. REEL 10 Continues: Recollections of period in convalescence home at Gateston, 12/1915-1/1916. Recollections of leave in Wigan, 1/1915: question of civilian knowledge of conditions at Gallipoli; reception; state of health. Recollections of duties escorting new recruits by train from Wigan Recruiting Office to Ashton-under- Lyme Barracks, 1/1916-4/1916: helping sort recruits into different units; origins and nature of recruits; home billets. Posting to 3/5th Bn Manchester Regt at Southport, 10/1916: reactions to receiving basic training and being treated as recruits; success of application to join newly formed Machine Gun Corps at Grantham, 11/1916. REEL 11 Continues: Recollections of posting as Company Quarter Master Sergeant of newly formed 203 Machine Gun Company Machine Gun Corps at Belton Park Camp, Grantham and Clipstone Camp, 11/1916-2/1917: check establishment and organisation of company; attending short Vickers machine gun course; supervising kitting out of troops from depot; horse rations; work in orderly room office and relationship with officers; discipline; troops machine gun training. Medical treatment and regrading during earlier period at Command Depot, Heaton Park, Manchester, 4/1916-10/1916. Joining 66th Division in Fovant area, Salisbury Plain, 2/1917. Move to France, 3/1917: reactions; train journey; stores arrangements. Recollections of operations in line in Annequind sector, Bethune area, 3/1917-8/1917: distribution of machine gun sections in line; role as Company Quarter Master Sergeant in supplying posts; rations issued; base at Annequind. REEL 12 Continues: presence of French civilians; sergeants' mess; duty organising billets for troops and nature of accommodation provided; rotation of sections at posts; comparison of conditions with Gallipoli; use of horses and story of using horse's gas mask during trip to Army Service Corps depot. Recollections of period in Bray Dunes sector, Nieuport area, 8/1917-10/1917: sea bathing; German reconnaissance aircraft. Recommendation for commission during move to Ypres area, 10/1917. Story of Field Punishment No.1 issued during period at Annequind, 3/1917-8/1917. Reaction to being recommended for commission and return to GB, 10/1917. Formation of officer cadet company at Pirbright, 10/1917. Recollections of preliminary tank course at Wareham and Bovington, 11/1917-12/1917: tank mechanics; driving techniques in Mark IV; conditions in tank; drivers' protection mask; machine gun course. REEL 13 Continues: Drill course under guards instructors at Pirbright, 12/1917-1/1918. Recollections of officers' training course at Hazeley Down, 1/1918-5/1918: subjects taught; mess dinners; tactical exercises and concentration on open warfare; examination, expulsion of cadet for cheating, passing out first and commission into Tank Corps, 1/5/1918. Period at Tank Corps Headquarters at Wareham, 5/1918: kitting out as officer; question of adequacy of kit allowance and pay. Posting to join 8th Bn Tank Corps in Doullens area, 5/1918. Aspects of service in Doullens area, 5/1918-11/1918: role as Mark IV tank commander; tank crew; quiet nature of area; occasional raids in support of infantry and effect of small arms fire on tank. REEL 14 Continues: Aspects of course as tank instructor at Le Treport, 10/1918-11/1918: question of tank tactics and cooperation with infantry; reaction to armistice, 11/11/1918. Return to 8th Bn Tank Corps in Doullens area, 11/1918-12/1918. Posting to 13th Bn Tank Corps in Cologne area, Germany, 12/1918. Aspects of period at Keltenhurburgh and Duren, 12/1918-11/1919: billets; relationship with German civilians; tank accident and burial of British soldier killed at Spa, Belgium; ban on fraternisation with Germans; role as demobilisation officer; messlife; promotion to lieutenant, 1/11/1919; question of demobilisation and running down of unit. Return to GB, 11/1919 and demobilisation, 12/1919. Question of alternative career prior to returning to mining industry, 1920. Period as miner prior to securing government backed place on mining engineering course at Mining and Technical College, Wigan: nature of qualification; rugby activities. REEL 15 Continues: Qualification as mining engineer and period as junior official at Worsley Mains, 1923. Period as manager at Leyland Green Colliery, 1923-1927: duties; role and activities keeping mine running during miners strike, 1926; closure of colliery, 1927. Background to establishing and running independent small colliery at Billinge, 1927-1950: selecting area and securing mining licence; drift mine workings; number employed; advantages of small collieries; production sales and profitability; effects of second World War, 1939-1945; central selling system developed by Lancashire Associated Collieries; role as chair of Federation of Small Mines on nationalisation, 1946; exemption of small collieries from nationalisation under licence; problems caused at Billinge drift mine by opencast mining above and consequent closure of mine, 1950s. Subsequent mining career. Effect of First World War on health.